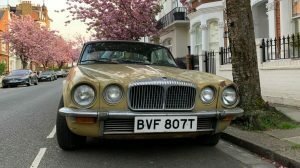 Let’s face it; many mid-’70s to mid ’80s cars represent a low-point in automotive history. 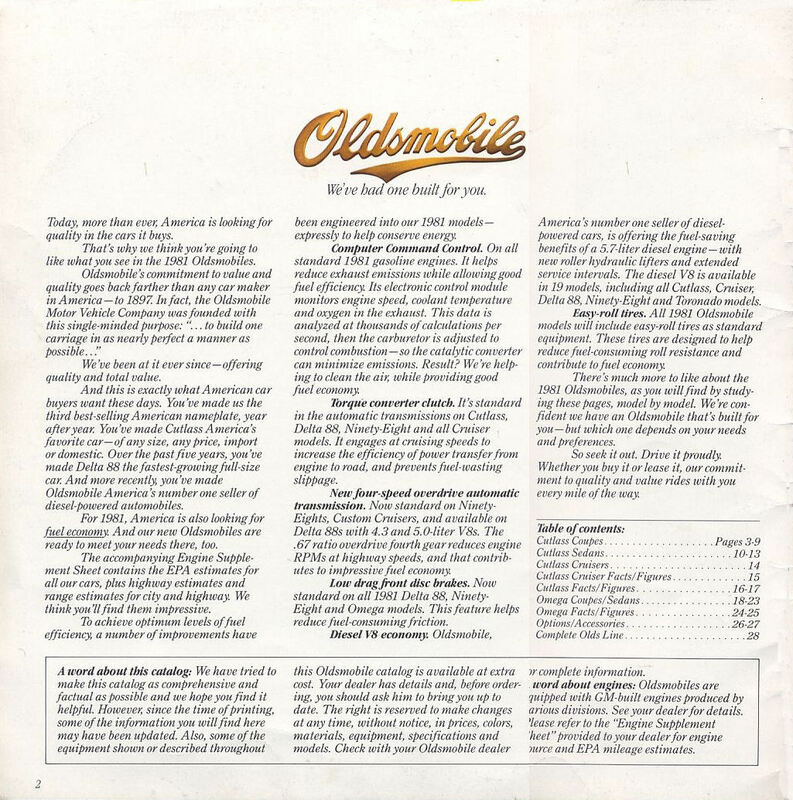 During the 1950s, Oldsmobile’s 88 had a reputation as the brand’s “image leader” and is sometimes called “the first muscle car.” By the time of this 1981 Oldsmobile 88 Royale in Mattawan, Michigan rolled off the assembly line, the 88 had become a car that (as I recall) one reviewer said “hears the call of the open road in the same pitch as a dog whistle.” Thanks to wikipedia.org for some details. Still, if you’re in the market for a roomy car and rarely transport more than one passenger, this Royale’s $5750 asking price here on autotrader.com may stack up well against more modern and common options. After a claimed 36,975 miles, the cloth upholstery should look at least this good, and it might clean up even more with some TLC. Like many cars of this era, it was hip to be square, and aside from a few concessions to function, circles are banished as a design element. General Motors experimented with square steering wheels and tires but ultimately conceded to the laws of physics and fitted conventional round parts for those purposes. In fact, the sales brochure boasted that “easy-roll tires” were standard equipment. The engine is described as a “V8,” hopefully the 5,0L version. Other options included the base 3.8L V6, 4.3L V8, and 5.7L diesel V8. The 5.0 would have come with a four-speed overdrive automatic transmission and highway-friendly 2.41:1 rear axle gears. Perhaps not surprisingly, horsepower numbers are nowhere to be seen. Move along, folks; that’s not what this car is all about. Thanks to lov2xlr8.no for some details. Don’t forget the “vacation-sized trunk!” How does this Olds stack up on your Used Car Checklist? Back in the day a salesperson at the company I worked for had this car but with two extra doors. It was his company car (leased) and one afternoon he came by the office and had to park near the truck dock. A rookie truck driver came out of the dock turned too short and the trailer wheels went over the left quarter and trunk lid. I couldn’t understand why Sales was so angry until he admitted that he loved that lease car so much he’d intended to buy it when it came off lease. Admittedly I still couldn’t understand but I pretended to feel badly about it. This one is in really nice condition and I hope that she finds a good home. I inherited a 1984 Olds 98 from my father, loved that car it was like sitting in a recliner going down the road. I still miss Oldsmobile, (and my dad) and I hope this 88 finds a good home..
I’ve had several late 70s to mid 80s Oldsmobile Delta 88 4 doors. Had some problems with the V6 & it’s transmission but the 305 & 350 V8s never gave me any trouble. 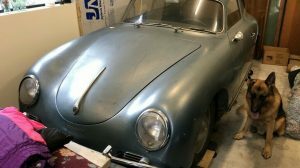 That may be due to the former ownership but my take on them is that I would jump on this one if I had the cash or if it had a lower price tag. Back when they were new, these cars were highly reviewed by Consumer Reports and most of the automotive press. They also sold a ton of them. They were everywhere back in the 1980s. Obviously, it doesn’t look so good now. But back in the day it, and it’s B-Body siblings, did the job well for millions, unless it had the 5.7 liter diesel, which was a whole nother matter! Related to this, I recently watched a program on the 1980 NFC Champion Philadelphia Eagles. Quarterback Ron Jaworski was shown driving a light blue 1980 Buick Electra. So these were status symbols as well as cars for everyday Americans. By 1981 the diesel was bullet proof. The DX engine is outstanding. It only took 1-2 years for Oldsmobile to truly perfect the diesel, where as Buick spent 30 years to fix the bad lubrication system in their V-6 and V-8’s. 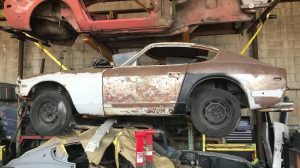 Ford never fixed the bad 350-400 modified V-8’s, they just dropped them. There are lots of other “lemon” engines out there, the manufacturer never addressed the issues. Duaney, I agree about the Olds diesel engines getting better. My wife and I drove a lot of early 80’s diesels, both Olds and Caddys. I could practically steal them and I knew how to ‘get them and keep them’ running. Also had couple of Olds Cutlass Cierras with the V-6 Diesel….great cars! 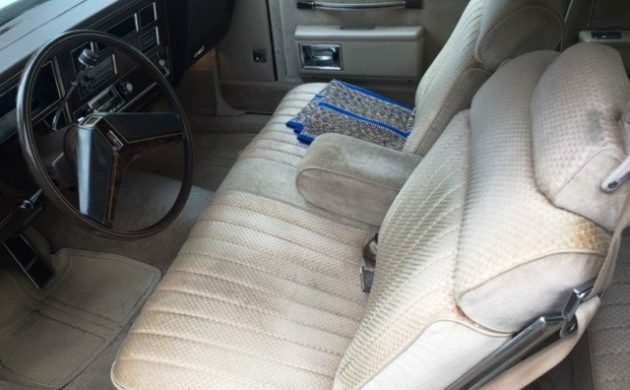 My inlaws bought an ’82 in Dark Rosewood and this color interior ( Camel ? ) with a 350 and 4 speed auto. It had the real high speed rear gears and would easily top 24 mpg with cruise set at 70 ( this was the 55 mph era ). We took it to Ohio and were cosseted by the roomy and luxuriously comfortable interior on a 2400 mile round trip. It was a heavy feeling yet nimble ride. When he passed I attempted to buy the low miler from the estate, but my other inlaws would have no part of it and sold it to a neighbor woman in their church. For 1500 less than my offer of 3500. I would have kept it in my collection as a token of good memories had with he and his wife…. instead it got ran into the ground in several years. 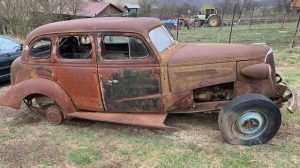 Rusted, dented, and now with a filthy interior I saw it a month ago in the hands of a young guy working at a fuel stop; and I cried once more for an opportunity lost because of jealousy. These full size 88 Royales were really nice cars, but when new they appealed to the blue haired population or the balding. Ouch! From the in-laws no less. The neighbor from church must’ve had a great need. My folks gave stuff away (sold low or outright donated) regularly to people from church on a routine basis. I understand your pain but I’m glad that you were gracious about it. My grandfather’s last car was an ’82 Delta 88 Royale in 2-tone light and dark redwood with matching interior. Very nice car. Would make an awesome sleeper with a 5,3 Is and a big ole turbo! 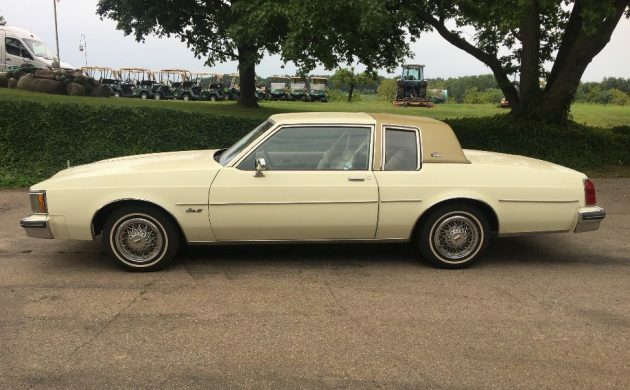 They rode nice, horrible motor, of 307, slug, if 350 not bad, almost bought a 84 new, car didn’t have youth attached to it, I was 23, I bought a Riviera instead, same miserable motor, 307 Oldsmobile, could’ve ran faster, it was the early 80s, GMs demise, bought Lincoln MK VII with 5.0 next, now we had power! I disagree that this era is a low point. These cars represent the last of the rear wheel drive vehicles, chassis design is perfected by now, engines were built to pass emissions and get better fuel economy. Only if you advocate for FWD and it’s drawbacks, would you look at this era as a low point. I forgot to add, the chassis design was so good on these GM models, that it was used up into the mid 90’s with Roadmaster, Olds Custom Cruiser’s, and Cadillac Fleetwood Broughams. More like a Creme Brulee than a Royale. 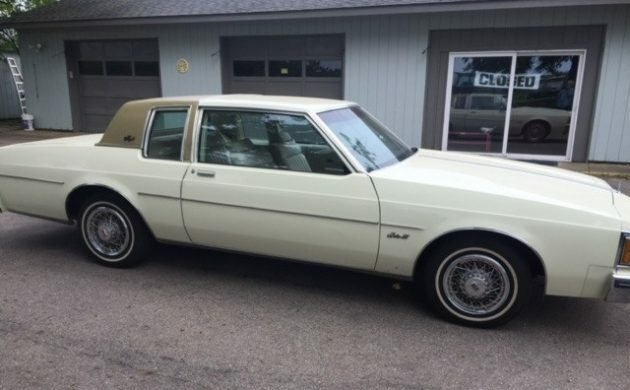 My parents had a 80 four door Royale Brougham, and Dad had an 85 Royale four door as a company car. Nice cars in the day. Both had Olds 307 4 bbl engines which were about 150 hp as I recall.